Mash the hard boiled egg in a bowl, add the melted butter along with a pinch of pepper and salt to taste. Mix well. Remove the crust from the slices of bread and roll (flatten) them softly with a rolling pin on a board. Now spread the egg mix evenly on each slice. Roll each slice gently, somewhat like a sushi roll. Wrap each roll in a foil and refrigerate it for 10 minutes. Now in a pan take oil and sauté garlic till golden brown. Add soy sauce along with a pinch of pepper and salt to taste. Add the cooked broccoli and give it a quick toss. Remove from pan. Take the rolled breads and remove the foil. Insert a toothpick each in a few broccoli stems. 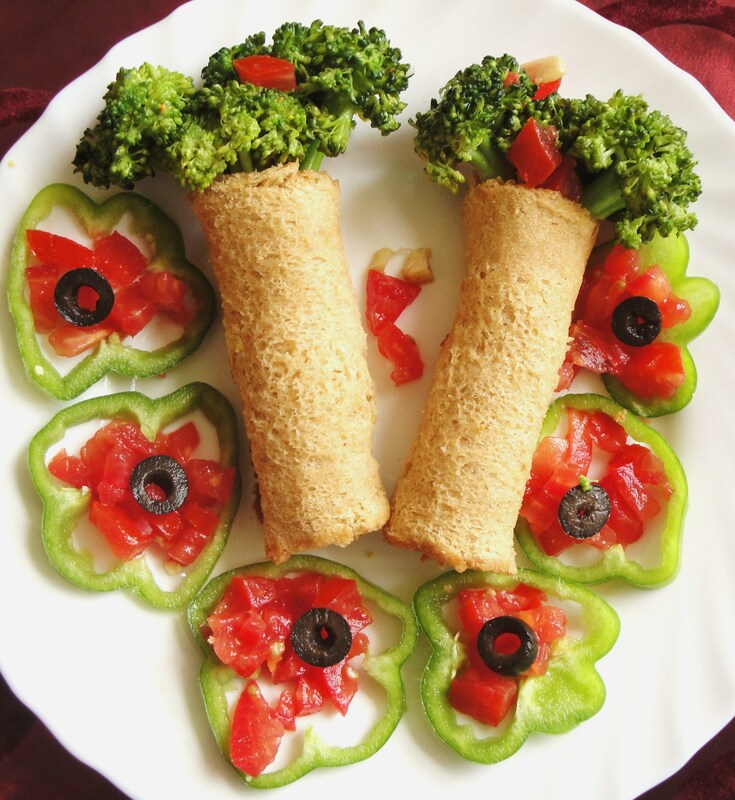 Place the stems on the rolled bread as shown in picture. Decorate a plate with a few capsicum slices and chopped tomato, topped with black olives as shown in picture above. 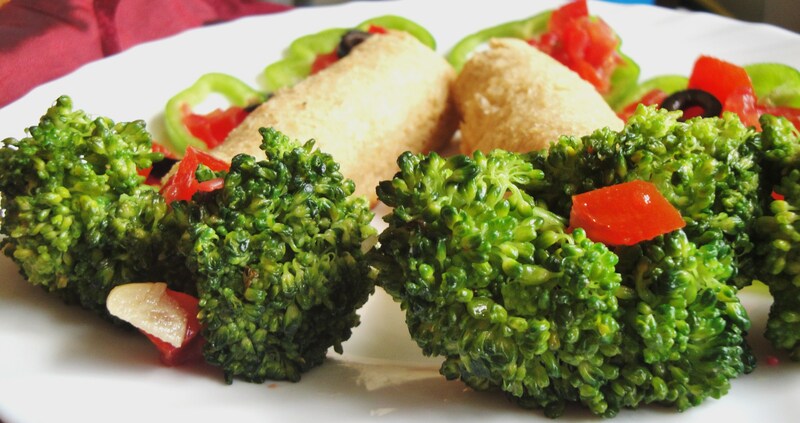 Place the prepared broccoli tree and serve. Kiddie Tip: Serve immediately. Also, the tree log can be cut into round slices…the egg spiral inside is fun for kids! Haha, that’s pretty. 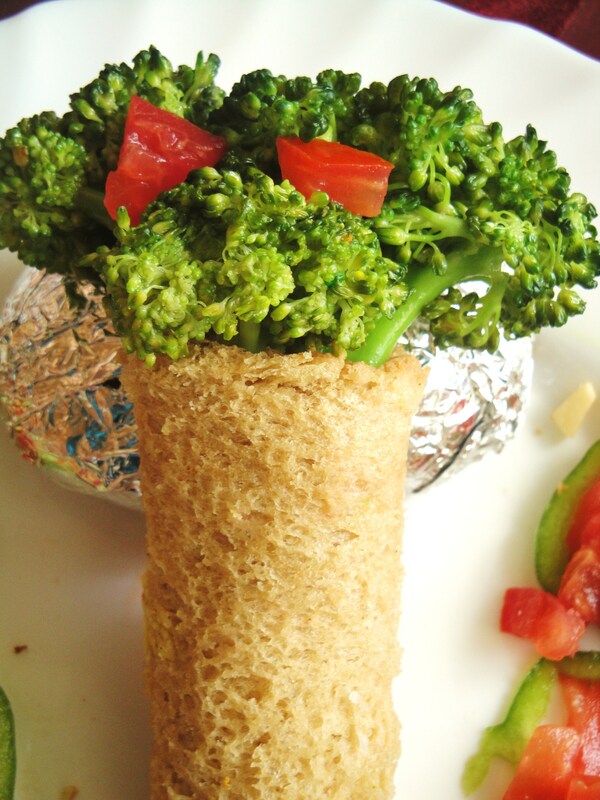 What a great way to get kids to eat broccoli. Thanks for the comment. Its always been my earnest attempt to get kids to eat nutritious stuff in this era of junk food! my apologies for a very delayed reply….but thankyou so much for your kind words. Thankyou so much for all the appreciation. My apologies for not blogging new posts for a while now, but I promise…very soon would post some new recipies. same topics talked about in this article? I’d really love to be a part of online community where I can get feed-back from other knowledgeable people that share the same interest. Thanks for visiting my blog. As of now, i am not aware of an online community, but let me surf and get back to you, may be we find something….else we get started to create it! Thankyou so much for all the appreciation. I am a novice blogger as well… the only tip I have to share is just keep posting…and keep trying all the options your theme has to offer…you might be pleasantly surprised! My apologies for not blogging new posts for a while now, but I promise…very soon would post some new recipes. Glad you liked them.My apologies for not blogging new posts for a while now, but I promise…very soon would post some new recipies. Receiving all those mail can be annoying…I understand. I am not very tech savvy, but would try to do my best from this end to help solve this problem. made to create this particular post amazing. Magnificent task! Thankyou so much. I apologise I have not been putting up new posts for quite a while now…but I promise, very soon I shall start posting new recipies. Thanks a lot… glad you liked it. Thankyou. I am glad you liked it. Thankyou for the feedback. Will surely consider it.